Hello, I just sent a check to your POB but am not sure you got it. I used PayPal to donate to your ministry but am not sure it went through. Go to DONOR TOOLS which is where you can create an account that links to all the donations we receive! You can also update your address, email address, make notes next to each donation (to indicate if it's a tithe, offering or first fruits) AND come here to get tax records on the very first day of the year! I don't want to use PayPal, I'd rather use my credit/debit card, how can I donate to your ministry? CLICK the PayPal button to Donate, then when the next screen opens, add the amount (top red arrow), then CLICK Continue (2nd red arrow). And on the next screen, it will ask for your Debit or Credit Card. 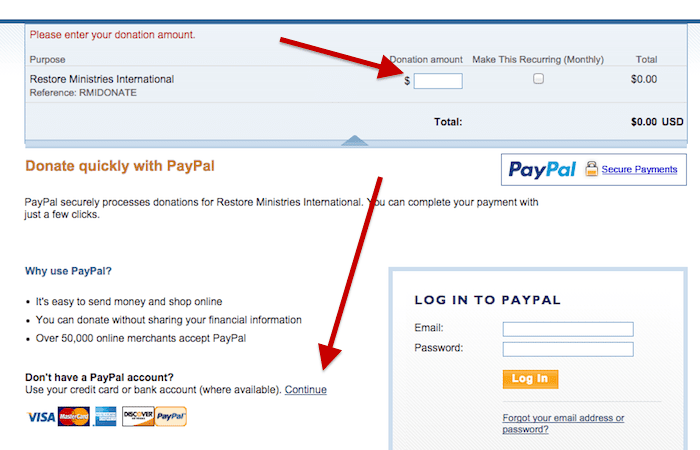 I don't use credit or debit cards or PayPal, how can I donate to your ministry? When we receive your check, you will be sent a Thank You email. You will also be able to see a list of ALL your donations by setting up a DONOR TOOLS account. Are you one of our RMI donors? Sign in or sign up to view all your donations and keep track of all your giving. 5. QUESTION:I have questions regarding tithing, can you help me find the answers? 5. ANSWER:YES, here is a page where tithing questions are answered, also how to ask Him directly, along with a link to submit a question to our team of ministers who will be very happy to seek God's wisdom with you.